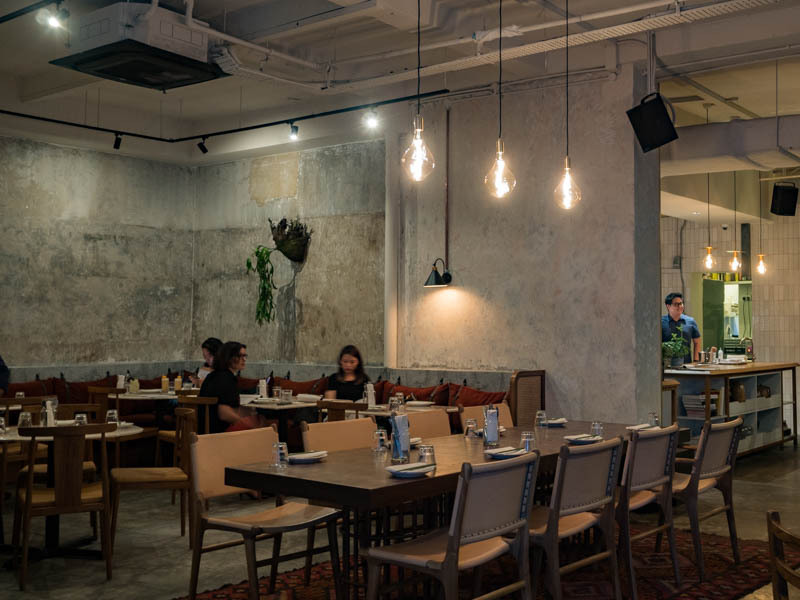 Previously located at Kampong Bugis, Kilo Kitchen has relocated to Duxton Road to be closer to its sister property, Kilo Lounge. The name ‘Kilo’ stems from the half blue, half yellow nautical flag for ‘K’ symbolising the message, “I wish to communicate with you”. With this in mind, Kilo Kitchen aims to use their carefully crafted dishes and relaxing ambience to impart this meaningful message. 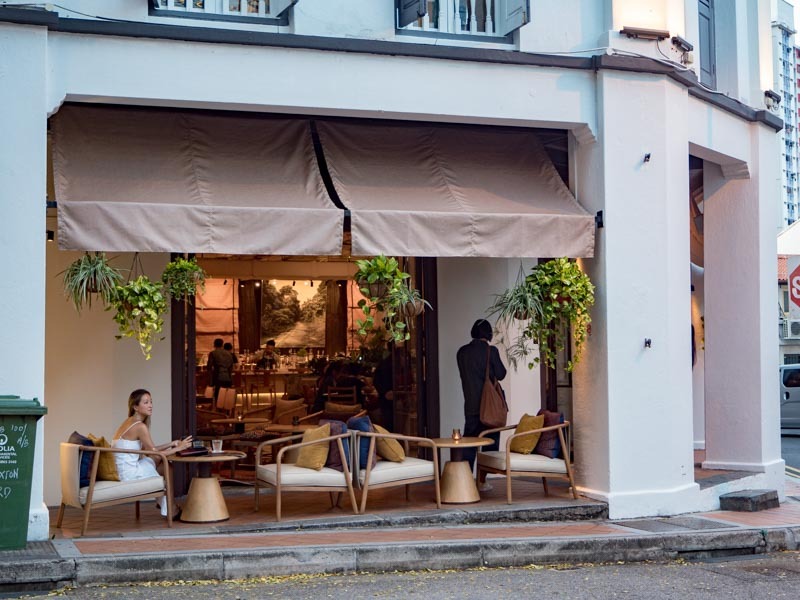 Like their original location, this new Kilo Kitchen also has a similar semi-alfresco dining. However, they have added a new open kitchen concept with a wood fire grill, so that diners can watch their dishes being prepared. 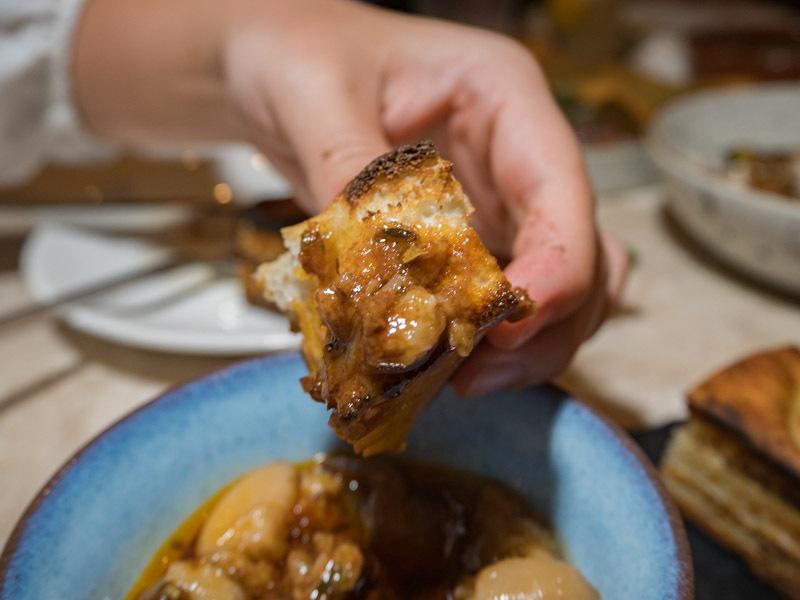 Kilo Kitchen’s menu was inspired by the heritage of their co-founders, Joshua Adjodha, Javier Perez, Sharon Lee and their returning Executive Chef Manel Valero. Since 2016, Chef Valero has been on a culinary sabbatical across Europe, even spending a period of time working in top Michelin-starred restaurants such as Restaurant Relæ and Geranium in Denmark. With his fresh new ideas, Kilo Kitchen’s menu is a combination of both Latin and Asian influences. Every dish comes with bold flavours, and is catered to our local taste buds. 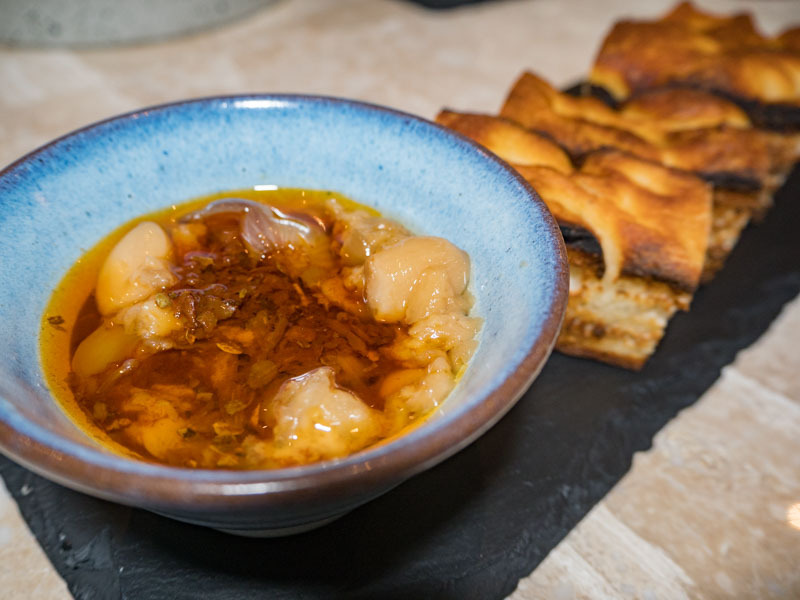 I started my meal with their PAN (S$7) snack, which was made with a fire-grilled fermented potato focaccia bread with the side of garlic and shallot adobo dip (a type of Spanish marinade sauce). As a bread lover, this was the perfect start to my meal. Unlike most focaccia bread, this rendition had a sweet and tangy flavour. Kilo Kitchen toasts their bread in their wood-fire grill, giving every bite a smoky aftertaste. Coating the bread with adobo sauce also added a slightly sour edge to the bread, whetting my appetite. If you’d prefer something more indulgent, you might enjoy their Crab Croquettes (S$8/two pieces, S$15/four pieces). This Spanish-inspired dish was made with a creamy béchamel (milk sauce) infused with some caramelised onions, fresh crab meat, and jalapeno peppers. The mixture is then deep fried until they’re crispy and golden brown. 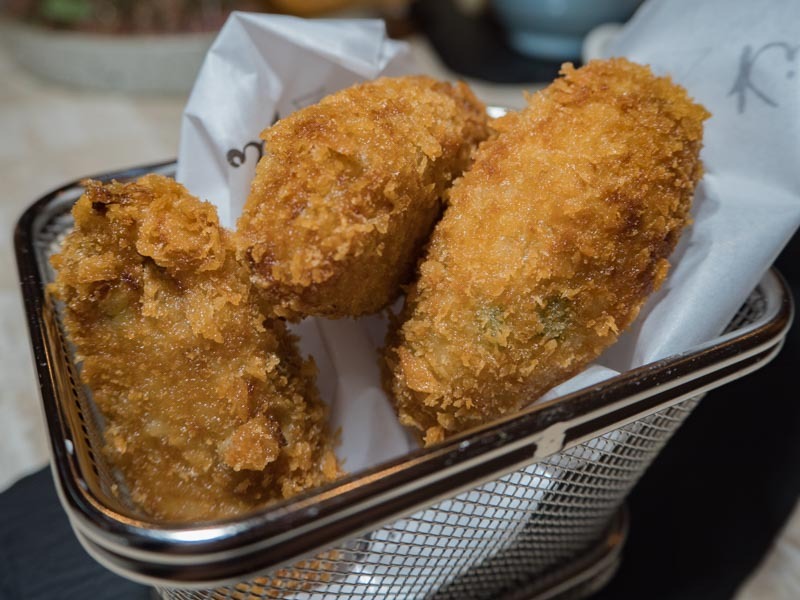 I had to be careful trying to pick up these croquettes as they were bursting with fluffy mash, while coated with a thin layer of breadcrumbs. 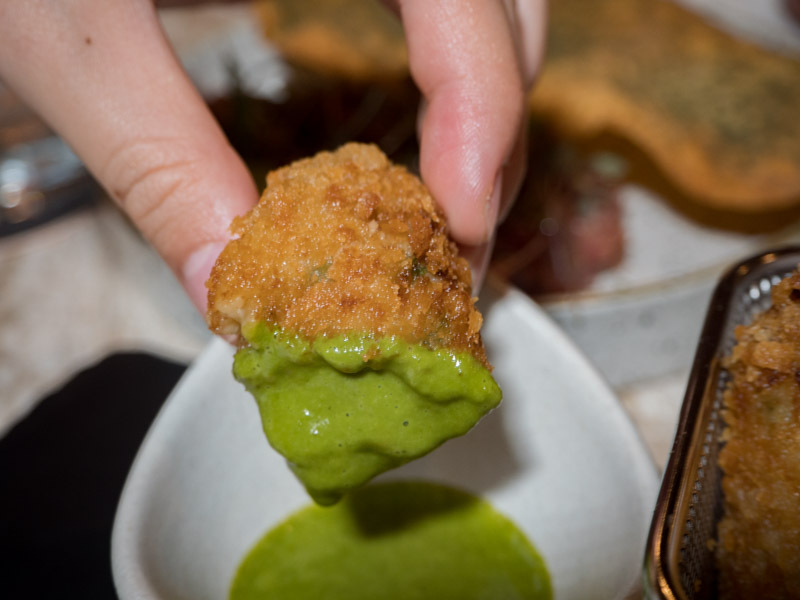 Dipping the croquette into Kilo Kitchen’s homemade basil vinaigrette, the sharp acidic bite from the vinaigrette helped to balance out the fishy flavour of the croquette. 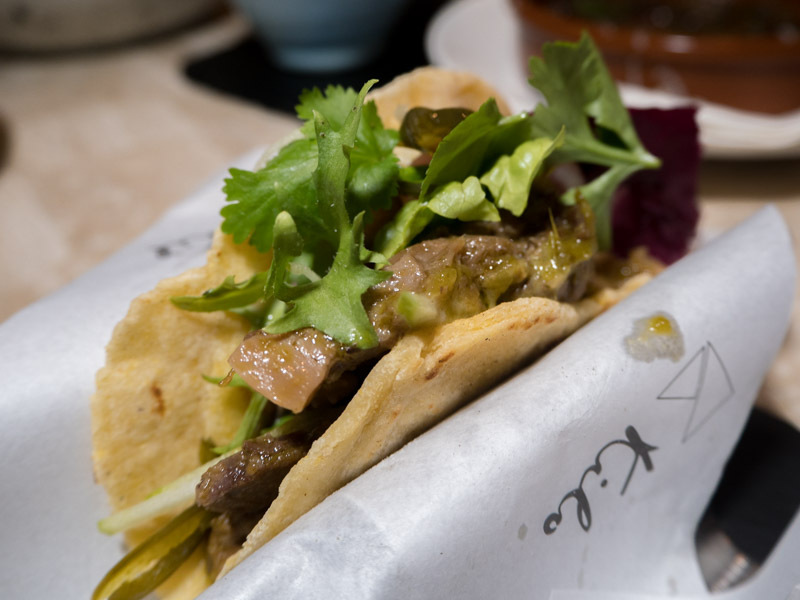 Moving on to Kilo Kitchen’s small sharing plates, I tried their Beef Tongue Tacos (S$18/two pieces, S$35/four pieces). Instead of the usual hard-shelled tacos, this dish was made with homemade soft-shell tacos. The beef tongue was seasoned with beef fats and roasted green chilli paste, and then pressure cooked to make the meat more tender. I enjoyed the sweet flavour of the apple miso slaw and the spicy kick from the green chilli and jalapeno pesto. I was unable to taste its traditional fermented flavour and could only taste the sweet flavour from the apple miso. The taco shell was soft and fluffy, and before I knew it, I had finished the whole taco. 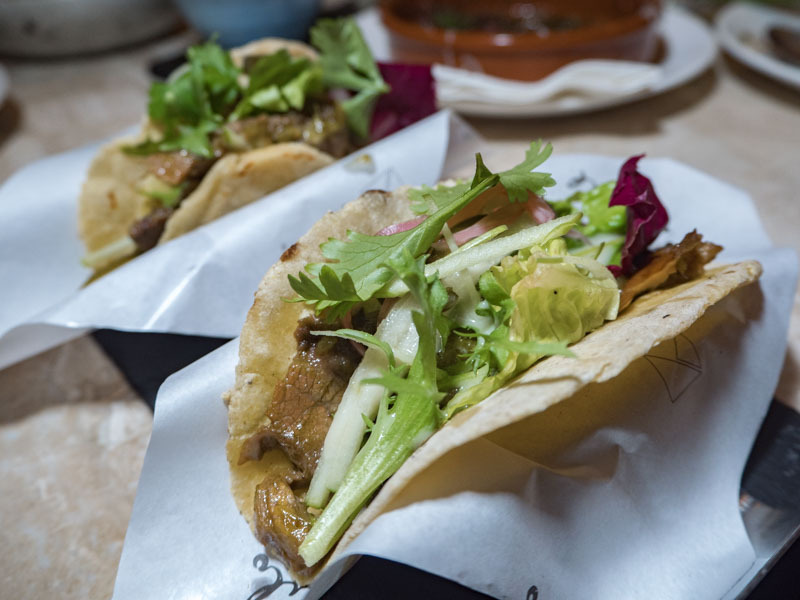 Don’t underestimate the tacos though, as they are very filling. Save some stomach space for the other dishes! Another unique dish that’s popular with diners is their Atas Lentils (S$26). 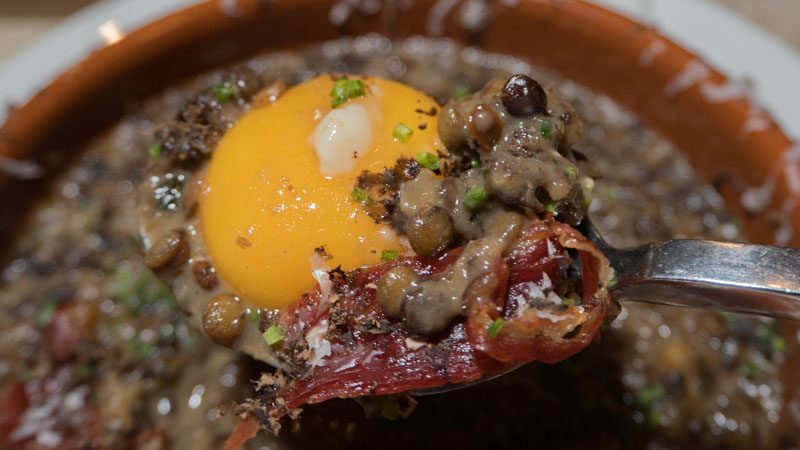 Topped with a pasteurised egg yolk, crispy jamon Iberico and grated truffle and cheese, this dish was made with lentils stewed in wild mushroom paste and truffle. If you are familiar with your cured meats, you’ll know that Jamon Iberico is a type of salty ham with a nutty aftertaste. Even though I enjoyed this dish a lot, the jamon Iberico overpowered the stewed lentils. In addition, mixing the egg yolk into the dish also helped to balance out the saltiness and added a creamy texture. While this was a tasty dish, I would have liked the truffle to be more prominent. If ‘re a big eater and small plates aren’t enough, Kilo Kitchen serves a larger serving of their Grilled Fish of The Day (Market Price). 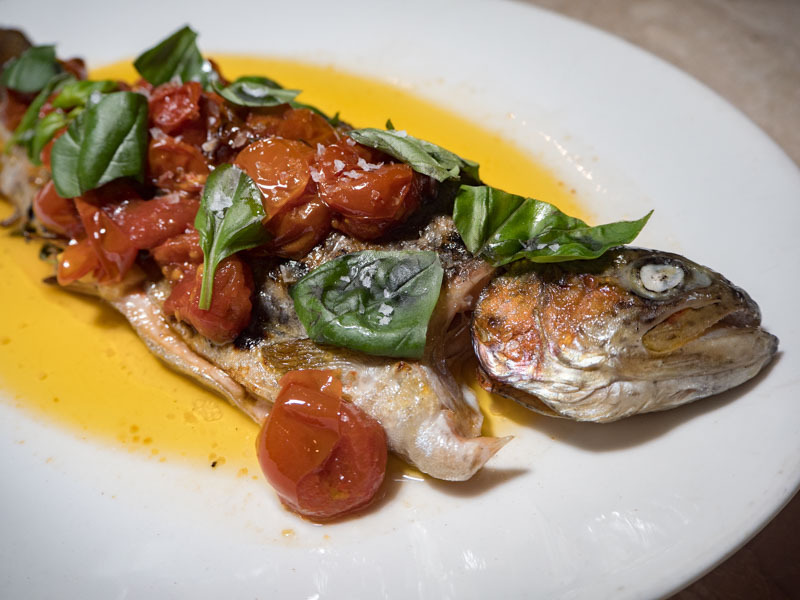 When I was there, I tried the grilled coral trout with brown butter sauce and charred cherry tomatoes. This was the favourite part of my meal, as the fish was fresh and light compared to the rest of the dishes. Lightly salted, the grilled fish reminded me of enjoying charcoal grilled fish in Thailand. The trout was cooked in their wood-fire grill which made the skin crispy, while the fish was soft and fell off the bone easily. 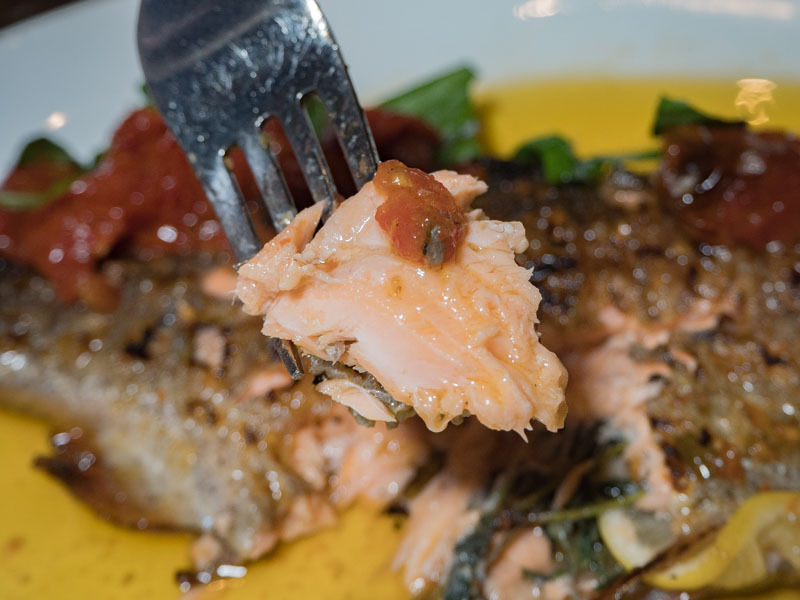 Fresh and sweet, the trout was even infused with a smoky flavour from the applewood and cherrywood. What’s a meal without a sweet ending? One of the notable desserts at Kilo Kitchen is their Coconut Tembleque (S$14). Templeque is a popular Puerto Rican dessert named for the wobbling movement of the coconut pudding. 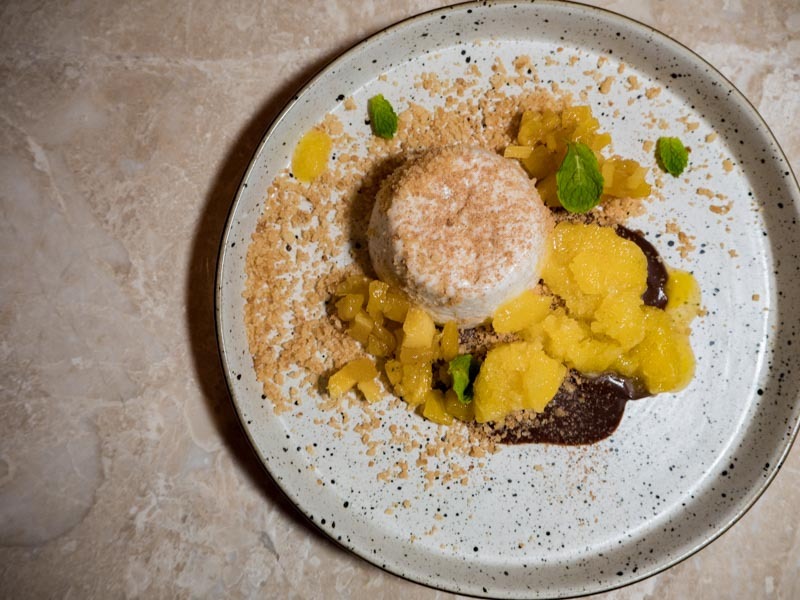 The dessert comes with caramelised pineapple, chocolate sauce, oat crumble and pineapple granita. This fresh tropical dessert was perfect for Singapore’s sweltering heat. The coconut pudding melted in my mouth like ice cream, while the oat crumble added a slight crunch. The caramelised pineapple didn’t make it too sweet and the pineapple didn’t overpower the pudding. I would definitely head back to Kilo Kitchen, especially for the more uncommon dishes like the Atas Lentils. Even though I enjoyed the food, Kilo Kitchen didn’t add any wow factor to their dishes. If you’re just looking for a relaxing spot to chill out with your friends, give Kilo Kitchen a try.